Car sharing is the cheaper and more environment friendly alternative to owning a car. 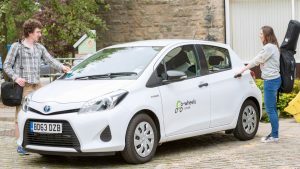 Working with Frome Town Council, Co-wheels will now have two low emission cars in Frome – one outside the Town Hall and another at the Cheese and Grain car park. These are available on-street 24/7 for members to use – once you have signed up just book online or via the smartphone app when you need the car and you only pay for the hours you use plus a small mileage charge. If you want to find out more and take up the special discounted offer check out the Co-wheels website at www.co-wheels.org.uk/frome . The offer gives you the chance to save money straight away – membership is only £1 instead of the usual £25 and you get £25 of driving credit added to your account to help pay for your first hires. Prices start at £5.50 an hour for the Toyota Yaris petrol-electric hybrid cars, plus 18p a mile, but that includes all fuel, insurance and other costs. Car sharing can work out cheaper than ownership because you don’t have to pay for bank loans, depreciation on your car’s value, fuel, insurance, car tax, servicing, MOTs, breakdown recovery and all the other costs that mount up as we maintain and check the cars regularly. It is also less cost for the environment as not only are our cars more fuel efficient than the average owned car in the UK but one shared car can keep up to 15 others off the road – and the biggest environmental costs is in making a new car. If you can cut out your own car and make smaller journeys by bike, walking or public transport then it can even make you healthier too. Just go to www.co-wheels.org.uk/frome and use the code FROME109 to get started.